Reid continued, “When women spoke up for the right to speak up, they wanted to vote, some insisted they simply, slow down, there will be a better day to do that, today isn't quite right. "When this body was on the verge of guaranteeing equal civil rights to everyone regardless of the color of their skin, some senators resorted to the same filibuster threats that we hear today." According to Harry Reid, on the issues of slavery, segregation and women having the right to vote, the Republicans were supposedly on the wrong side of history. 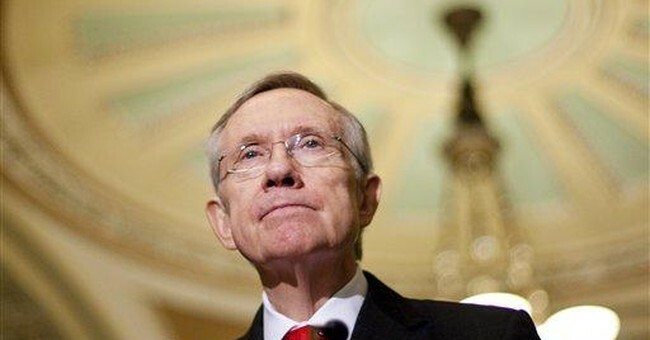 Well, let’s examine history and see if Reid’s accusations have merit. When the Civil Rights Act of 1964, which would end segregation nationwide, came to Congress for a vote, a number of Senators did, in fact, threaten to filibuster the bill as Harry Reid stated. What Harry Reid did not mention is that 80% of those Senators that threatened to filibuster the Civil Rights Act were Democrats. In fact, 31% of Democrats in Congress voted against the Civil Rights Act of 1964. That means about 1/3 of the Democrat Party refused to end segregation nationwide. How did the Republican Members of Congress vote concerning the Civil Rights Act of 1964? A total of 82% of the Republicans in Congress voted to end segregation nationwide. In other words, segregation ended when a larger percentage of Republicans voted in favor of civil rights. Harry Reid’s charges against the Republican Party are baseless and false concerning the end of segregation. His charges are false concerning slavery, women’s voting rights and civil liberties as a whole. From the very beginning of both the Democrat and Republican Party’s history, there has been a huge difference concerning civil rights and liberties. The Republican Party has a history of favoring civil rights while the Democrat Party has a history of opposing them. In the early 1850’s, President Franklin Pierce, a Democrat, broke his promise to the Congress by refusing to restrict slavery in the newly founded western states of America. Pierce allowed slavery to expand in the western states after saying he would not. The consequence of Democrat Pierce’s broken promise was the creation of the Republican Party. In 1854, Abraham Lincoln and some of his friends in the Whig party created the Republican Party for the purposes of ending slavery and upholding a conservative interpretation of the U.S. Constitution. They met in a little white schoolhouse in Ripon, Wisconsin. At the time, no one could have predicted the growth and influence of this new political movement -- a movement driven by the promotion of civil rights and liberties. In 1860, when Abraham Lincoln was first elected as President of the United States, he swept into office Republican majorities in both the U.S. Senate and House of Representatives -- mostly because the Republican Party opposed slavery and the Democrat Party under Pierce expanded slavery. In that same election of 1860, every major northern state elected a Republican Governor. Truly, a political revolution had begun. The revolution continued when Abraham Lincoln’s Emancipation Proclamation made all slaves in the areas won by the Union Army legal citizens of the United States. After winning reelection in 1864, Lincoln started his second term in March of 1865. President Lincoln soon gave a speech stating that the slaves he helped free should be given the right to vote. In the audience, as Lincoln spoke of freed slaves being given the right to vote was John Wilkes Booth. Booth, a southern Democrat, soon carried out his assassination of the President. The Republican Members of Congress responded to Booth’s assassinating President Lincoln by passing a total of three Constitutional Amendments banning slavery, extending all the rights found in the U.S. Constitution to all citizens of all states, extending equal protection and due process rights to all citizens, as well as the right to vote. Lincoln’s dream of freed slaves being given the right to vote became a reality when the party of Lincoln made it so. Building upon their party’s civil rights victories, a Republican Senator, Aaron Sargent, wrote the Women’s Suffrage Amendment of 1878. The amendment would allow women the same right to vote as men. The amendment failed due to strong opposition by members of the Democrat party. American women had to wait another 40 years to obtain the right to vote. In fact, the Democrat Party opposed each and every piece of civil rights legislation brought forth by the Republican Members of Congress of that time. Without the majority vote in Congress, these same Democrats had little ability to derail the Republican efforts for true equality. Instead, they turned to more nefarious activities to re-enslave the African-Americans set free by the Republicans. The Southern Democrats responded to the Republican wave of liberty by creating a mafia style organization that sought to punish all African-Americans who engaged in their newfound freedoms. Through violence, abuse and murder, this organization became the battering ram of the Southern Democrat party. What was the name of this organization? It was none other than the Ku Klux Klan (KKK). As the Klan wreaked havoc on Africa-American people and the sympathetic white citizens who assisted them, the Republican civil rights revolution continued. In fact, the first ever African-American Members of Congress, both in the House of Representatives and Senate, were Republicans. In 1870, Joseph Rainey of South Carolina became the nation’s first ever African-American Congressman. Senator Hiram Revels of Mississippi became the nation’s first ever African-American Senator that same year. The Republican Party drew more and more African-Americans to its membership for two generations. Every single African-American member of the United States Congress was a Republican until 1935. The New Deal, as President Franklin Roosevelt (FDR) called it, drove a stake right through the heart of the Republican civil rights revolution. From that point on, the Democrat Party began to make in roads within the African-American community. Before we honor FDR as a great civil libertarian, let’s take a look at one of his most notorious judicial nominations to the Supreme Court, Hugo Black. Black was FDR’s first Supreme Court nomination and a member of that mafia like organization, the KKK. In fact, as an attorney, Hugo Black defended a member of the Klan who was charged with murdering a Catholic priest. FDR himself refused to meet Jesse Owens, the African-American Olympic athlete who put Hitler’s athletes to shame in the 1936 Berlin games. Let’s contrast this with Dwight D. Eisenhower, a Republican President around the same time as FDR. Eisenhower activated the elite Army unit, the 101st Airborne, in order to assist nine African-American children in Arkansas. The children’s lives were being threatened for simply wanting to attend school with white students. Eisenhower, the former WW II commander, fondly referred to as “Ike,” made it completely clear to the nation that bigotry would not be tolerated on his watch. The commander of the European Campaign during WW II became the Commander-in-Chief of the civil liberties of all Americans. Unlike Harry Reid and his own party’s history, the history of the Republican Party shows a party that has made it a practice to measure all Americans by their conduct only, not by the color of their skin or any other demographic. This was the dream of Dr. Martin Luther King, himself, a registered Republican.